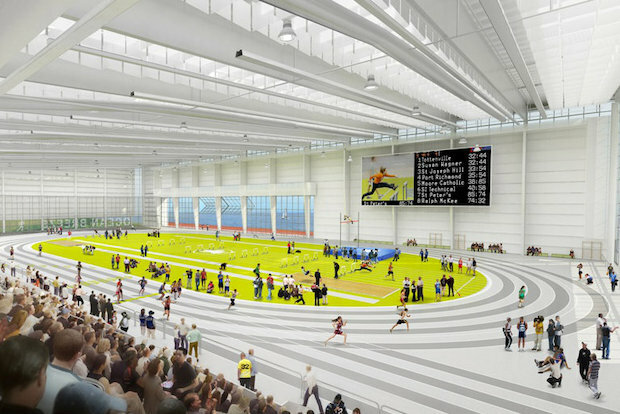 NYC Parks today announced that its Ocean Breeze Athletic Complex (Ocean Breeze) was approved by The New York State High School Athletic Association (NYSPHSAA) Executive Committee to host its Indoor Track & Field Championships through 2022. The NYSPHSAA Indoor Track & Field Championships have been held at Ocean Breeze since 2017. With the new agreement, beginning in 2020, Ocean Breeze in Staten Island will host the prestigious event through the next four years. Ocean Breeze and NYSPHSAA are excited to continue this partnership and host the elite high school athletes from all over New York State. In the brief history of the NYSPHAA Indoor Track & Field Championships at Ocean Breeze, a few records have been broken. Last year, Katelyn Tuohy of North Rockland High School broke the 1500M record with a time of 4:23.38, surpassing Mary Cain’s mark of 4:24.25 set in 2012. During the 2017 event, Sammy Watson of Rush Henrietta set the new meet record with a time of 1:28.67 in the 600M. Jill Shippee of Shenendehowa set the new meet record in the weight throw with a mark of 60’07’. NYC Parks’ Ocean Breeze Athletic Complex is a 135,000 square-foot, state-of-the-art indoor track and field facility in Staten Island. The first facility in the United States to be recognized as a certified International Association of Athletics Federations facility, Ocean Breeze has hosted 14 major championships, including three major national competitions since opening in 2015. The complex also serves as a community resource, offering recreational and athletic amenities to Staten Islanders.